Paw Province: What Is Bloat? DISCLAIMER: This post explains the horrifying reality of dogs bloating. I am not trying to scare anyone or worry anyone. I am trying to prepare you in case of emergency. Please with bear with me during this post and understand that I am just here to educate you on the subject. Today I want to talk about something that I find is very important for all dog owners to know. I hope none of you will have to put this information to use (other than the bloat prevention section of this post), but it's still crucial that you all understand what bloat is. Bloat is a dangerous, and sometimes fatal, condition in dogs that happens when a dog's stomach fills with gas, food, or fluids that make it expand. When a dog bloats, their stomachs twist and they have a very hard time breathing. Bloat can occur with any dog, but it's most common in deep chested breeds like Great Danes, Saint Bernards, Bloodhounds, Boxers, and even Dachshunds. However, even if your dog isn't one of these breeds, it's still important to do your best to prevent bloat. What makes a dog bloat? There are many reasons a dog's stomach could bloat, and sometimes it happens for no reason at all. Sometimes dogs could also bloat because it's in the dog's family. Help! My dog might be bloated! How can I tell? It's important to know the signs of bloating in case your dog ever bloats. If your dog exhibits any of these signs at all, take your dog to the vet immediately, no matter what time it is! Bloat can be fatal and some dogs unfortunately can not be saved from it. Your vet will place a tube down your dog's throat to your dog's stomach to release some pressure. Your vet will also take X-rays to see if your dog's stomach is bloated severely. If it is, he will perform surgery immediately on your dog not just to stop the bloating, but to ensure your dog doesn't bloat again. I don't want my dog to bloat! How can I prevent it? Admit it...bloat is scary. Nobody wants to have to experience their dog bloating, and I hope none of you will have to. However, it doesn't hurt to try and prevent your from bloating. I follow all of these options with Christmas, and I can have peace of mind knowing the chance of him ever getting bloat is very low because of the care I give him. 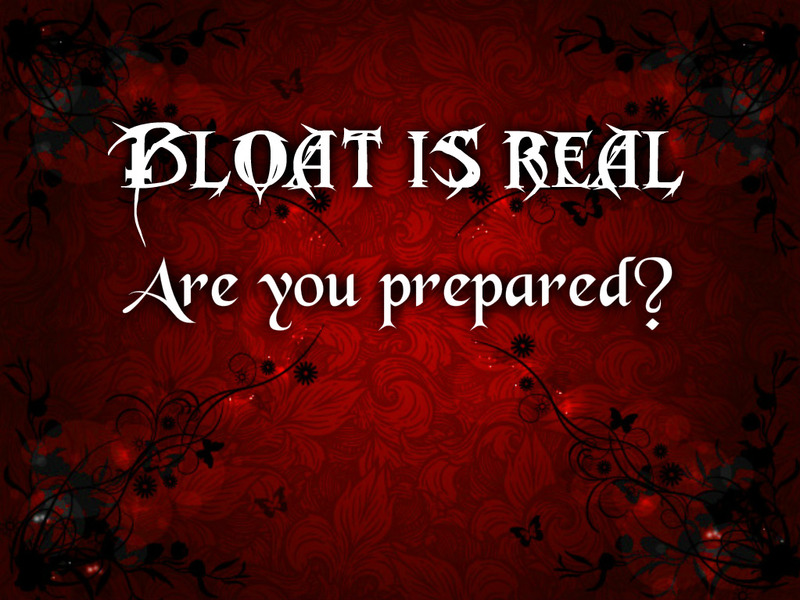 Bloat is very scary, and it can be fatal, but that doesn't mean you have to constantly worry about it. Most dogs live their lives without bloating, and hey, now you know how you can help prevent bloat! If you don't have one already, I highly recommend that you use an interactive feeder for your dog to make sure they don't eat too fast and that they properly digest their food. Before I had the interactive feeder, Christmas would often throw up and the food he'd throw up was barely chewed at all, due to the fact he ate it so quickly. The bowl also mentally stimulates your dog! You can click here if you'd like to purchase the Outward Hound fun feeder, the bowl I recommend and the bowl Chris uses. Although it happens very rarely, bloat is real, and it is scary...it could happen. Are you ready? Great post, Miss Robin! Bloat is very scary stuff! Thank you for the good advice! Thank you for this impawtant infurmation! Crikey Robin ... Thankyou! I have a REALLY big chest. I'll make sure Mum reads this. I sure don't want no tube stuck down my throat. A very impawtent post, especially for deep chested dogs. There used to be a giant full sized Dood that looked like a big picture of me. We had the same color furs and the same name. Mom got a picture of me with him when I was a baby. Anyway, he died from bloat. It was very sad and scary. Our pawrents don't let us eat before running and then we have to wait 90 minutes after before we can eat anything. Excellent PSA. We hate having to wait to go and play after we eat! Thanks, Robin,for caring and sharing. When I worked at a vet's, we would get large dogs in that had bloated. I am so thankful the vet was able to save them, usually with surgery. My horse died from it - their stomachs twist and they can't expel anything from either end. Momma lives in fear of bloat because I have a super-deep chest, and it's usually deep-chested dogs that get affected. The skeeriest part is that no one's exactly sure what causes it. Some people say that eating from a raised bowl causes it, some days it helps prevent it! Momma watches me like a hawk and checks my tummy any time I'm acting off. Two other symptoms to watch for are trying to throw up or potty but nothing comes out.